The President seeks revenge through “You’re Hired” as he can’t use “You’re Fired”. Fed speakers abandon Chairman Powell and abandon ship in order to save themselves. The Fed prepares to Twist into the economic slowdown. Mr Market goes long duration in anticipation of the Fed’s Twist. 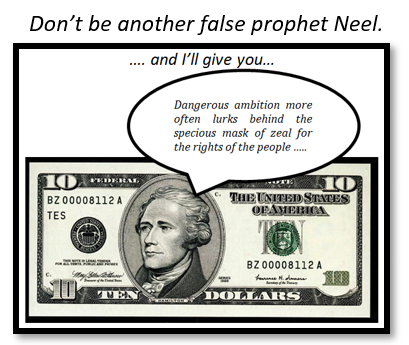 False prophet Neel Kashkari goes for the jugular(s). The popular media have made much of the "Revenge of the Doves" at the Fed. Next up on screen is Revenge of the President. President Trump now has a blue ocean ahead, which he can turn red with the blood of his enemies. Having failed with his traditional fighting brand of "You're Fired", the President has elected to try using his new brand of "You're Hired". 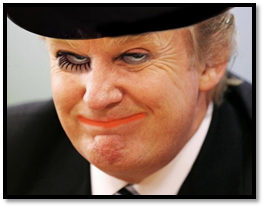 It's going to be "real horror show" for Chairman Powell and his Droogs from now on. Some of the Droogs are already slinking off; and some of them are trying to become the new leader of the gang. The spectacular failure of Witchfinder General Mueller, to convict the President of un-American sorcery with Russian warlocks and wizards, will come as another significant blow to Chairman Powell. The President's call on the economy and interest rates is already better than Powell's. The President's experiences of the ducking stool and his evasion of the bonfire will not have made him any more pleasantly disposed to his perceived enemies. Expect bitter and expect ruthless. Also, expect President Trump to call for a Watergate-style investigation into Democratic interference in the Republican election campaign, which led to his election and ongoing interference since then. Susan Rice's calculated insertion of the questions, about the President's direct collusion with Russia, will now require some re-evaluation in light of recent findings. Rice's poison pill looks like something more systematic than just sour grapes at the time. As the Democrats asked, no stone should be left unturned. Such turning of stones could become part of the Republican strategy to head into the next presidential elections. The initial public response from President Trump was his criticism of the Fed as having "mistakenly raised interest rates". In the President's opinion, balance sheet reduction was also "ridiculously timed". It later transpired that the President had a terse phone exchange with Chairman Powell as markets slid post-employment data on March 8th. In said exchange change, the President is alleged to have said that "I (the President) guess I am stuck with you (Powell)." Evidently one should not be expecting "You're fired" from the President in relation to Chairman Powell. Clearly, this option has been considered, however, and then discarded. The President's next moves suggest that "You're Hired" is his weapon of choice. Further humiliation may make Chairman Powell wish that he had been fired. After inserting the dagger, the President then twisted it further and opened the wound. Positioning the US economy as the victim and himself as first-responder, he tweeted that the patient remains healthy despite the Fed's "unnecessary and destructive actions". Chairman Powell could argue that said health justified the Fed's actions, but it would be futile and even more dangerous to engage in debate with the President in the public domain. Since the President is "stuck" with Chairman Powell, he has signalled his intentions and capabilities to influence the Fed through his nomination of new governors. His next intended influencer will be Herman Cain. The White House has now framed the debate for the Fed as the issue of cutting interest rates by 50 basis points immediately. Nothing the Fed says or does from this baseline is of any importance, as once again President Trump has seized and framed the narrative. Only strong economic data will save the Fed. Strong data will then, however, put the Fed back into conflict with the President, by mitigating for a further tightening of monetary policy. Only by sincerely following its guidance on letting inflation overshoot will the Fed avoid this conflict. The last report suggested that it was "Squeaky Bum Time" at the Fed. During this period of nervous reflection and anticipation, FOMC members are expected to turn their attention to divining if the current economic soft-patch is temporary or recessionary. Fed bums will be even squeakier, now that the President is on the warpath. The Fed was in its comfort zone. Now, it is in the alarm zone, with a big target on its back, whilst the economy makes the transition from the discomfort zone to play catch up. Expect desertion and expect betrayal. Mistakes will be made in the emotional panic. Chicago Fed president Charles Evans's squeaky guidance is certainly making all the appropriate noises. Back in October 2018, he was proudly proclaiming that Fed policy could become "mildly restrictive" and then remain so "relatively indefinitely". In December, he voted for this with his feet when the FOMC hiked interest rates and adhered to the balance sheet run-off on auto pilot commitment. "Relatively indefinitely" sure ain't what it used to be! Evans' latest guidance is now that monetary policy may have to ease if the current conditions persist, or even are expected to persist relatively indefinitely. Parsing a similar situation, to when the FOMC played wait-and-see in 1997, he is nervous about the lack of inflation pressure. This Bernanke-era Dove recently became a Hawk right at the peak in the interest rate cycle. The squeakier his guidance becomes, the less credibility he will retain. Evans' incoherence then runs into overdrive, as he also believes that the Fed could hike again this year, even though he also thinks that inflation could be allowed to overshoot to the 2.5% level. The only thing that one can conclude about Evans is that he is uncertain and wishes to cover all the bases so that at least one of his broken clocks will be right. The pressure from President Trump is clearly getting to him. Despite his purported faith in the powers of the US economy, Harker is in favour of shortening the duration of the Fed's balance sheet assets. He identifies this strategy as preparation for the ensuing Twist back along the curve when the economy finally slows. Presumably, when he divines that it is time to Twist, he will revert back to this current point in time and say "I told you so". FOMC members have an amusing way of U-turning and trying to cover the traces of their initial cognitive failure. Harker is right up there with the doyens of this art. He's the guy who didn't want to raise interest rates last December but could still see another rate hike this year! Although lacking the courage to openly dissent at the last rate hike, or even soon after, Harker would now like it to be known that his Dot Plots were not as bullish as the rest back then. It has taken him the best part of three months' time and incoming data to suddenly remember that he didn't want to raise interest rates after all. As he slinks away from the Chairman, under cover of weakening data, he would now like to be seen as a guy who did not support the last rate hike. Harker should in fact be remembered as someone both lacking in loyalty and the integrity to disagree based on his principles and professional views. The instinct for self-preservation is clearly high in Harker. It comes at the expense of his Chairman and his colleagues. Harker has inadvertently opened the Fed to scrutiny of its internal rivalries and betrayals. Academics are apparently no better than soap opera actors. 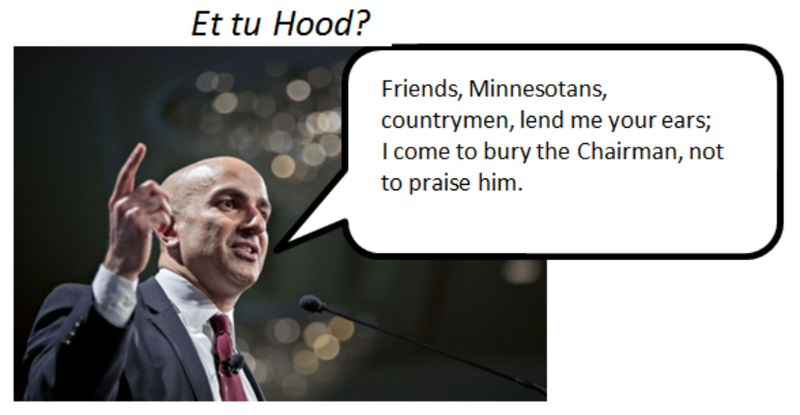 Minnesota Fed president Neel Kashkari is a diva in this regard. 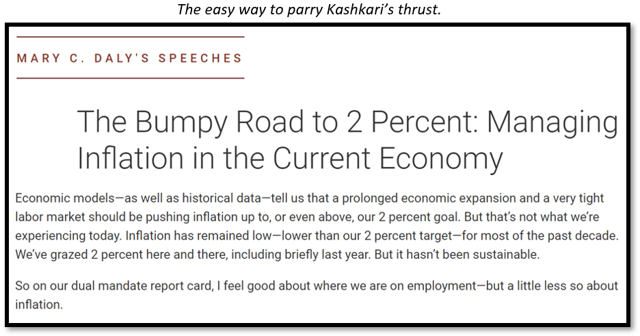 Kashkari is enjoying the notoriety that he has earned, as the "baby-faced assassin", since his initial urbane shredding of Chairman Powell and his acolytes. So confident is he, in his own ability, that he is also willing to spar with President Trump. Recklessly challenging the President to bring it on, Kashkari informed the Commander in Chief that the Fed is not paying him any attention. Such gallows bravado is amusing for the observer and inflammatory for the President. It also signals that the Fed is certainly listening to the President, otherwise Kashkari would not have been aware of the incoming Presidential invective that he and his colleagues allegedly pay no attention to. Kashkari has already been defeated by the President, because he has allowed the President to choose the time, the place and the weapons of combat. The same goes for any of his colleagues who chose to take on the President. 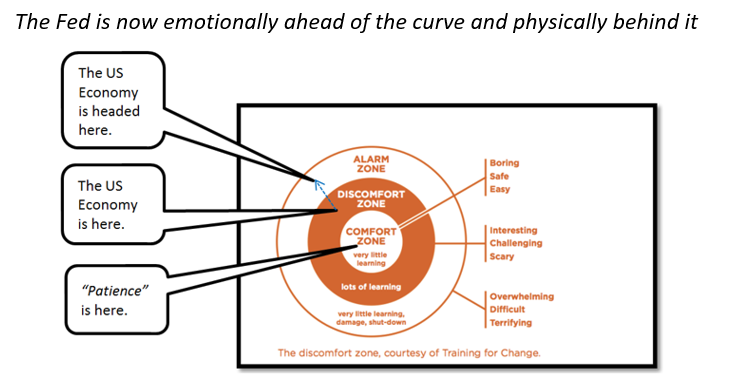 Wiser combat strategists would try and shift some or all of these parameters in order to give themselves a chance. They would also use the battlefield of the economic data to their advantage. This wisdom is clearly lost on Patrick Harker and Cleveland Fed president Loretta Mester. In their eagerness to defend their own positions, they have engaged with the President and his critics thereby taking the bait. Now, the Fed is institutionally engaged with its critics directly in consequence. Harker played a weak hand by "never saying never" to a rate cut, whilst Mester has recently opined that if she is correct, the Fed is not done with rate hikes. The lack of a consensus response or a game plan to deal with critics is an error that the Fed will pay dearly for. Currently, the weakening data favours the President more than it favours Kashkari, since the former has been more vociferous in calling for rate cuts than the latter. If the data strengthens, then Kashkari will have to become more Hawkish by default, which compromises his Dovish baseline. He thus faces an asymmetric outcome, in which the data defeats him either way. Kashkari would thus be served best to give up a war that he cannot win. The only question now is whether Kashkari will take the rest of the Fed down with him when he falls. He may well have to fall on his sword well before he endangers the institution. With the Chairman in retreat and his acolytes deserting him, Kashkari is now moving in for the kill on his boss. His actions are prompted by what he aggressively calls a "serious beef". His latest well-timed blow delivers a sucker punch to those of his colleagues who believe that the high level of labour force participation is a vestige of an inflation-prone economy. Kashkari strongly refutes any strong causal relationship between wage-push inflation and the fact that ageing Americans are returning to and staying in the labour pool. In his view, ageing Americans are not seeking employment because labour markets are tight and wages look attractive. On the contrary, these returning workers represent an untapped reserve of a potentially much larger labour pool. In effect, they are deflationary and not the inflation signal that the Fed assumes they are. Kashkari believes that the FOMC should look directly at the inflation numbers, rather than through the prism of the Phillips Curve of an alleged tight labour market. If it did so, the conclusion and monetary policy action would be totally different than what has gone before. Kashkari was very careful not to look too deeply into the circumstances of the aged returning workers or their pecuniary motivation. Had he done so, he may have found some victims of overly-tight monetary policy followed by overly-easy monetary policy. The tight monetary policy threw them on hard times, and the easy monetary policy that followed then made it impossible for them to live off their savings; assuming that they had any that had not been decimated by the tighter policy phase. He would do well not to blow too hard on his trumpet, since he has danced to the same dissonant tune in the past. Kashkari omitted to note the fact that many ageing Americans have to work because they do not have enough saved for retirement. A high cost of living in retirement, especially in relation to healthcare, is therefore an economic headwind which forces them to prolong their working lives. Low interest rates and liquidity in the banks, rather than in their pockets, do not exactly help them either. Kashkari's dramatic conclusion is, therefore, that the current tighter monetary policy which has been made because of this incorrect reading of the labour market signals is erroneous. Having pulled the pin out of the grenade, he then left the room whilst the explosion occurred. Career fatalities are to be expected; and the FOMC body-count may be extensive. It's hard to see the Chairman not being fatally wounded in career terms from the latest guerrilla attack. There is however a softer option that avoids casualties and fatalities. San Francisco Fed president Mary Daly's less inflammatory view of the Lowflation issue contrasts strongly with Kashkari's take. Daly finds that Globalization is the culprit that is causing low American wages. This amorphous title covers a multitude of sins, which have resulted in the collective loss of the pricing power of labour for various reasons other than just international competition. Daly's application of this catch-all culprit, which is also a favourite of Chairman Powell's, neatly avoids the pain and embarrassment of admitting that the Fed has been labouring under the misperception of the labour market and wage inflation for some time. Daly then goes on to argue that the Fed has been too successful in achieving its inflation mandate. Consequently, the 2% inflation target has become an ingrained inflation expectation. As a result of this success, the Fed now has the opportunity to focus exclusively on its growth mandate; which means that it can let the economy run hotter from an inflation perspective. Daly, therefore, comes to the same conclusion as Kashkari, but without all the painful introspection and loss of credibility. The US Government Accountability Office (GAO) estimates that almost half of Americans approaching retirement having nothing saved. This latest estimate is actually an improvement! The incentive to return to the labour market is clearly a strong one and is clearly working, given the incremental improvement in this egregious demographic situation. Chairman Powell has recently shown a commitment to make monetary policy more user friendly for the asset/employment-poor. He has clearly got a long way to go on delivering on this promise, assuming that it is a sincere one. Daly's less critical holistic solution would be far less damaging to the Fed than Kashkari's headline-grabbing personal crusade. Despite his urbane aggression, Kashkari is still hesitant about delivering the fatal blow which effectively throws his own lot in with President Trump. He is, therefore, still not calling for a recession which requires rate cuts, but does converge on the current White House's position with his view that current monetary policy may be too tight. Before calling for a rate cut, however, he accepts that it is prudent to wait for the incoming data to confirm the move. In the event of another slowdown, Rosengren then intends to Twist into longer duration assets with Harker. As with his Twisting partner Harker, Rosengren still expects a further rate hike based on the US economy's intrinsic strength. Also, like Harker, he seems to miss the point that another slowdown will require net balance sheet addition rather than a simple duration switch to flatten an already flat yield curve. Under pressure to extricate himself from the frame through which President Trump has boxed the Fed in, Rosengren risks perjuring himself or at least losing all his credibility. His latest guide for the perplexed observer sets out to refute all criticism of the Fed's policy of shrinking the balance sheet on auto-pilot. This decision has now been reversed, so anything that Rosengren says about it is redundant. As President Trump's Fed nominee Stephen Moore noted, the Fed's recent policy pivot is like an admission of failure. The only reason for Rosengren to discuss it is therefore to save himself. Readers who have, or have had small children, will recognise a similar pattern of behaviour from an errant child that has been caught misbehaving. At least, kids grow up in the end. Apparently, Fed presidents don't. Unsurprisingly, Rosengren does not believe that balance sheet run-off has contributed to recent market volatility. He then goes on to explain that keeping the balance sheet at an expanded level will promote the conditions that will prevent further market volatility. This subtle contradiction is evidently lost on him. Further adding to the spectacle, he suggests that more balance sheet expansion can be expected when the economy slows further. The misconceptions and realities, to which he refers in the title of his latest speech, seem to be his own. The pressure is clearly getting to him and in consequence he is losing the plot. It is sad to watch him fall so low and even sadder listening to his procrastination. So clear is the duration guidance, of Harker and Rosengren and so clear is the incoming data, that Mr Market will simply buy long duration bonds now in anticipation of the hapless Fed Twist later. As the Fed shortens duration, to prepare for the Twist, Mr Market will Twist. Convexity and volatility hedgers will then add to the momentum behind this counter-Fed duration buying. The yield curve flattening, therefore, once again will become a self-fulfilling prophet of economic doom. The two Twisters risk further embarrassment through their misunderstanding of the monetary policy transmission mechanism. A flatter yield curve initially stimulates the economy with falling yields. This stimulated economy will be seen by the Twisters as a reason to hike interest rates again. The end of balance sheet run-off will also have the same initial stimulating effect, that the Twisters will see as reason to tighten further. The Twisters made the same mistake back in December. Another rate hike, or even the hint of it, will then act as the true headwind that tips the economy backwards. The flat yield curve recession indicator iron law thus always wins in the end. The chances are that global developments will overcome and overrun US monetary policy in any case. Said global forces are unequivocally recessionary headwinds. The two Twisters are not alone in their misperceptions. New York Fed president John Williams and St Louis Fed president James Bullard are also sticking to their own Dot Plots. Williams sees the economy recovering in Q2 and, therefore, sees no need to consider cutting interest rates. Bullard sees an interest cut as "premature". We'll call these two Stickers, in order to differentiate them from the Twisters. Bullard's downplaying of the risk to Fed policy making, from the appointment of Trump henchman Stephen Moore as a Fed Governor, additionally risks provoking the President to raise the level of his attacks and hires even further. Fed Vice Chairman for Bank Supervision Randal Quarles has also shown himself to be a Sticker. He believes in the innate strength of the US economy and still believes that higher interest rates lurk beyond the current pause. Interestingly, though, he is not so bullish as to require a further tightening of monetary policy by default through the raising of the counter-cyclical capital buffer. He can't therefore sincerely believe that the US economy is as strong and resilient as he says that it is. If he did, he would be advocating building the counter-cyclical buffer and/or raising interest rates right now. 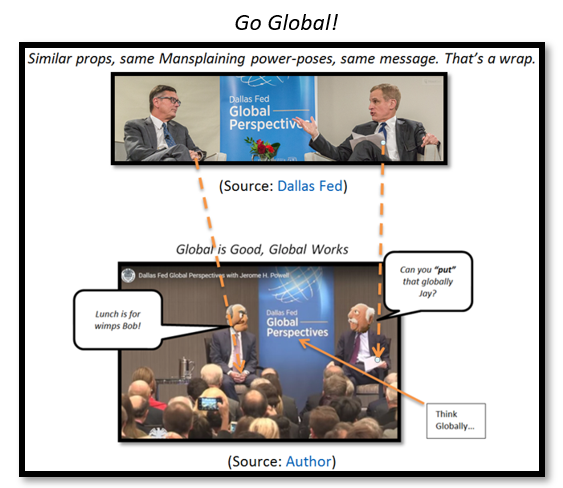 Dallas Fed president Robert Kaplan is a Sticker. Like the "baby-faced assassin" Kashkari, he would like to wait for the data to make up his mind for him. Fed Governor Michelle Bowman did not indicate if she is a Sticker or Twister in her recent commentary. She did, however, note that she is carefully monitoring the distress in the farming sector, which has been an early casualty in the trade wars. She sees worrying parallels with the farm sector crisis in the early 1980s, although she notes that the level of sector leverage is much lower today. Vice President Richard Clarida is a Globalist first and foremost, as one would expect a former PIMCO guy to be. He recently opined the risks to the US economy from global "spillovers". His globalism is limited to remaining "patient" for now, but he is clearly spring-loading the case for monetary policy easing if the global situation deteriorates further. Kansas City Fed president and former Hawk Esther George is now firmly in what she refers to as "wait and see mode". She is thus data dependent, although she openly admits that the threats are to the downside. With hindsight given this balance of risks, she still remains unwilling to admit that the last rate hike may have been a mistake, however. Of the new initiative, to incorporate inflation overshooting into the Fed's monetary policy framework, she remains agnostic but is clear that she will need a great deal of persuading. This differentiation between Twisters and Stickers, Globalists, wait-and-see-ers etc. etc. should not be viewed as a major breakdown in the Fed's ability to create a consensus. Both groups are still on hold and await a rebound. The Twisters simply wish to create an insurance policy now just in case the slowdown gets stronger and more permanent. The differentiation serves to illustrate the degeneration in Chairman Powell's grand plans for guiding with a single voice. The fear of being wrong has made all concerned default to a position of preserving their own reputation; by concentrating on their own guidance rather than that of the Fed as a whole. The resulting cognitive dissonance undermines them individually and as a team. Dissonant and divided, they will be conquered by the President.